Jonathan Rigoni is a founder of North Shore Capital Group and has been a leader in the financial services industry as a financial advisor since 2006. Over that period of time, he has advised clients in the management of their investments as it relates to their personal and business goals through an independent perspective. Jonathan is an acknowledged teacher and coach in investment management and enjoys meeting clients where they are financially and helping them achieve the next level of financial independence. Jonathan holds numerous licenses including his Series 7, 24, 63, 66; Life and Health insurance lines. Prior to his years as an independent consultant, he was an investment representative and financial advisor at Edward Jones. 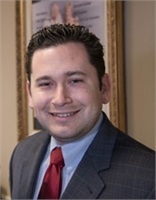 Before he began his career as a financial advisor, Jonathan held his real estate license and played an active role in the management of his familys extensive residential real estate portfolio. At North Shore Capital Group, the combination of these skills has served him well as he continues to guide his clients through current market conditions. Being an active volunteer has always been important to Jonathan. For many years he was a volunteer EMT, serving residents of northern Lake County by logging more than an estimated 5,000 emergency ambulance calls. In 2005, Jonathan aided in the search and rescue efforts as a first responder with Superior Air Ground Services in the wake of Hurricane Katrina. Additionally, Jonathan has been active in the Kiwanis community for over a decade serving as President for multiple terms in different club locations. Outside of the office Jonathan is internationally well traveled and enjoys spending quality time with his wife and daughter. He enjoys a summer day at the lake or an evening cheering on his Chicago sports teams. When work and pleasure intersect, you may find Jonathan visiting a regional office or an international hub of an investment management firm to gain a better perspective of their local economy and how it impacts his clients.